Paleontologists say they have discovered a previously unknown subspecies of Tyrannosaurus Rex sticker that played electric guitar. MISSOULA, MT—Calling the discovery a major breakthrough for our understanding of the past, paleontologists working onsite in central Montana announced Thursday that they have excavated the earliest known dinosaur stickers on record. Members of the scientific community told reporters that the landmark finding could provide a rare insight into an era, many decades ago, when the prehistoric-reptilian adhesives were widespread across North America. 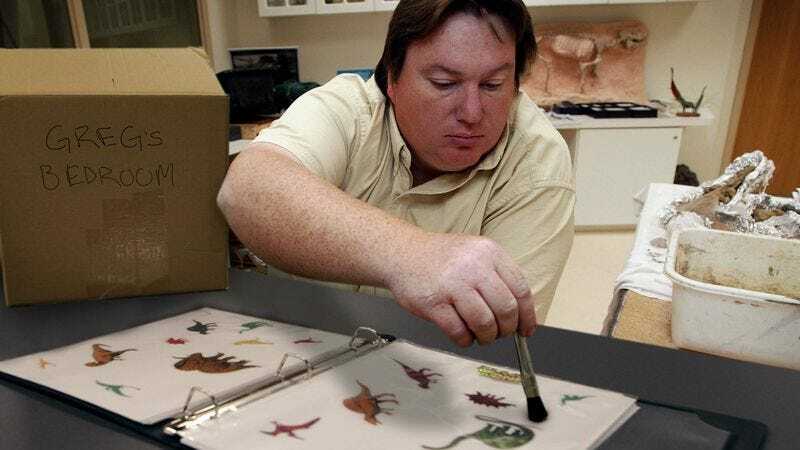 Dr. Harold Enten, lead paleontologist on the six-month expedition, confirmed that his team found the dinosaur stickers at the bottom of a cardboard box labeled “Greg’s Bedroom,” buried beneath strata of spelling tests, math worksheets, and baseball cards from the early and mid-1970s. “Though it required painstaking effort, our field workers were able to reconstruct an entire Tyrannosaurus Rex sticker as well as restoring the complete word ‘Dino-myte!’ underneath,” added Enten. According to the paleontologists, preliminary carbon dating of the specimens has prompted dramatic revisions to the previously accepted timelines of several early dinosaur stickers, suggesting that orders such as the laid-back, Hawaiian-shirt-wearing Brachiosaurus; soccer-ball-kicking theropods; and the Pterodactyl with aviator goggles and a long, flowing scarf could have first appeared as early as the summer of 1973. In addition, the paleontologists were able to verify that the earliest known dinosaur stickers were contemporaries to the saxophone-playing crocodile sticker. Researchers hailed the discovery as even more significant than prior historical finds, including the 1998 unearthing of a toothbrush-holding Stegosaurus traced to a New Mexico dentist’s office and the extraordinary 1987 excavation of a fully intact glow-in-the dark Diplodocus skeleton sticker. “Further evidence even suggests the startling possibility that these beasts were the evolutionary ancestors of rollerblading woolly mammoth rub-on tattoos,” Enten added. Based on the frequency with which they found the specimens affixed to a Yamaha keyboard, spiral notebooks, and school folders, researchers determined that the more fearsome carnivorous dinosaur stickers such as the Velociraptor and Spinosaurus appeared to flourish, while less impressive herbivorous dinosaur stickers were commonly left untouched on their original sticker sheets. The scientists shared their most noteworthy and paradigm-shifting discovery at the conclusion of the press conference, revealing that dinosaur egg stickers were, perplexingly, just as large as adult Brontosaurus stickers.